Hoping to make some progress on the bus next week when we are on break. First step was getting the batteries for our solar setup. Bus you might want to do it to. Minus the rear of the mini. I'm having a wrap made for the inside of the 24" door to the garage, it'll look like no door looking into the garage with the Ferarri parked in it. erm- what are the specs on those batteries, cost? Pretty decent price because they were in stock, so no extra shipping costs. No, we decided to go with the 12v, not the 6v. They also have a 10% discount if you order online and pickup in the store. It just about covers the core cost since we didn't have any, obviously. No wonder we couldn't find 215ah batteries, those are 228ah. I couldn't tell from your pic, looks like 2 large 12 cell batteries. Is it in fact 4 batteries? 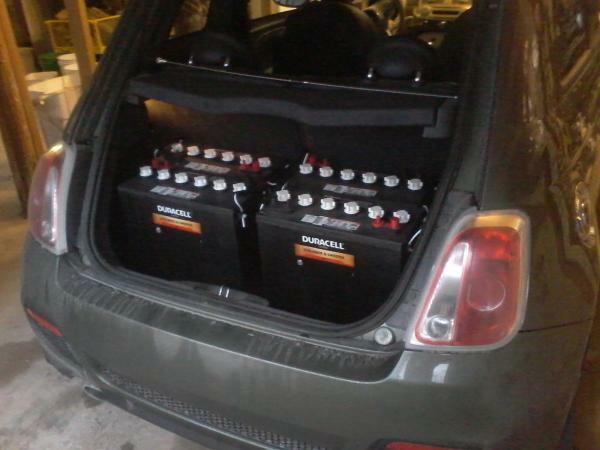 Yes, 4 of the 12v 215  ah batteries. The part number does list them as 215, but the sticker on them shows 228 @20a. So we should end up with 860-912ah for $1200 and a weight of 500 lbs. Also, fewer cables than 6v batteries as noted in the other thread.